The government has been urged to consider building more orthopedic Centres considering the fact that the few that are available are insufficient to absorb the demand for services that they offer. Commenting on unconfirmed reports that the Parirenyatwa Orthopedic Centre was facing viability challenges and was on the verge of closing, Alusi Milasi, the rehabilitation technician at Leonard Cheshire Disability Zimbabwe (LCDZ) said sutch a development would negatively impact those in need of the services at a large scale. “LCDZ recently bought prosthesis or artificial legs from the Parirenyatwa Orthopedic Centre at reasonably affordable prices for two children under our care. They have been making special shoes for children with leg length discrepancies and also produce quality products. “Apart from Parirenyatwa, Jairos Jiri Orthopedic Centre also produces them but we have cultivated cordial working relationships with Parirenyatwa and had begun to trust their products more hence it is my fervent prayer that reports of an imminent closure are false,” Milasi said. In an interview with Newsday, chief executive officer of Parirenyatwa Group of Hospitals Zigora said it was not possible to close the centre at any time. “There is no possibility whatsoever that the centre will close. The centre is currently operating. The equipment is functional and the required materials are available. There was a slight problem with water seepage into the electricity distribution board. Machines were shut down to avoid further damage. The problem was rectified and the centre is back to normal,” Zigora said. Milasi said LCDZ is receiving quotations from Parirenyatwa Orthopedic Centre from children who would like to get artificial legs. Children with disabilities were said to find it easier to get assistance from local orthopedic Centres. A South African company called Otto Box is reputed for being a leading player in specialist aids and appliances for people with disabilities but it was noted that going to that country to access their services was cumbersome and expensive. “To get Otto Box services, a child would need to go to SA for measurements and allow the time for making of the accessories. In the meantime they will be back in the country after which they would go back for fitting. If the fitting is good we come back to Zimbabwe to allow them to make final touches on the product until it is complete. Thus accessing orthopedic services elsewhere is hectic, time consuming and expensive,” said Milasi. Children with disabilities often require caregivers when travelling long distances, making it more expensive for organizations that care for them (mostly donor-funded). In 2014, a certain seven-year-old child, whose identity can not be disclosed because there was no consent from her parents or guardians at the time of going to print, was referred to LCDZ for specialist care after she had difficulty with walking and going to school. “This girl had a fracture on the leg when she was a week old. She had a sharp bone protruding from the tibia. When we took her in, we made efforts to have her operated on at Karanda Mission Hospital but it wasn’t a success. After that we took her to Parirenyatwa Orthopedic Centre where an X-ray was taken before they referred us to an orthopedic surgeon called Dr. Bawas. The surgeon simply asked us to buy a metal plate to be inserted into the leg and did not even charge us consultation fees. The total cost of the surgery is around $5000 but he did it for free,” Milasi said. Kudakwashe Bwanali, born with leg length discrepancy, was also grateful to LCDZ for helping him get a prosthesis from Parirenyatwa Orthopedic Centre. 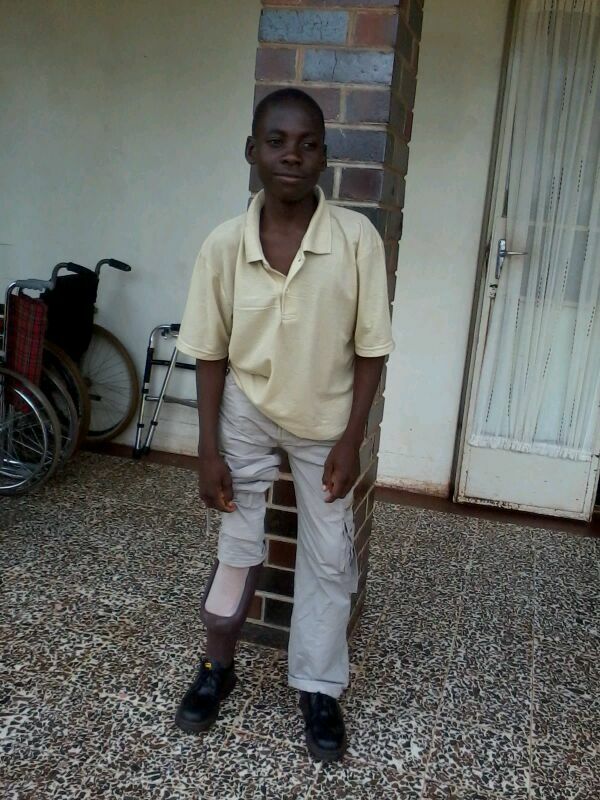 “Apart from acquiring my artificial leg, LCDZ is also paying my school fees, providing me with school fees and stationery. I am now in Form 3 at Masikana Secondary school in Marondera and I look forward to working extra hard so that I may reach university level in terms of education,” Kudakwashe said in the company of her mother, Betty Bwanali.